If the Windows 7 online activation is not possible, you can activate Windows 7 via phone system! To use the licensed version of the operating system without its official purchase, you need to know how to activate Windows 7 by phone (telephone, smartphone, iphone). This will allow you to safely download any programs from the Internet. Tip: ► create a Windows 7 universal DVD! 1.) ... Start phone Activation! 2.) ... Select the Country for phone Activation! 3.) ... The confirmation ID for the phone system! See also: ► Should I use with AMD64 Windows-7 x86 or x64? Please start the cmd.exe in administrative mode! (Image-1) Activation via phone system! 2.) Select the Country for phone Activation! And then "Click the nearest location" for activation via phone system (Image-2)! Then you can see (See Image-3) the phone number and get a confirmation ID! (Image-2) Click the nearest location! 3.) The confirmation ID for the phone system! (Image-3) get a confirmation ID, call! Activation helps verify that your copy of Windows is genuine and that it has not been used on more computers than the Microsoft Software License Terms allow. In this way, activation helps prevent software counterfeiting. Windows-7 - FAQ-37: How can I activate Windows 7 via phone system? How to activate windows 7 over phone? Activate windows 7 via telephone? Show me other ways to activate windows 7? Windows 7 confirmation ID phone sestem coad? Windows 7 confirmation id the phone system gives you? Enable activate windows 7 by phone? Windows 7 activation by phone? Use automated phone system not available? What is windows 7 activation contact telephone numbers? Phone number for windows 7 activation? Windows must function to activate by phone is where the telephone? How much does the phone for the Windows 7 product activation? Use automated phone system to activate does not work. Why? Where can I find the Windows 7 product activation phone number? How this is done by telephone to activate Windows-7? How to activate windows 7 by phone on cmd? Windows activation does not have automated phone system option? How to activate windows 7 professional over the phone? Activate by phone windows 7 not available? Confirmation id for windows 7 ultimate? Activate windows now windows 7 ultimate confirmasi I'd phone? Confirmation id the phone system windows 7? Contoh nomor type the confirmation Id the phone system gives you? Windows 7 ultimate confirmation ID? Confirmation id on window 7 in Nigeria? How to start window activate telephonic ser? Confirmation id to activate window 7 stater? Id phone konfirmasi windows 7 ultimate? Windows 7 confirmation id no.? Myanmar free download system win 7computer software? Installation id for windows 7 activation? 100% automated phone install option? Activate windows 7 by phone option missing? Show me other ways to Activate missing not found greyed? Installation ID for windows 7? Activate windows 7 via cmd? 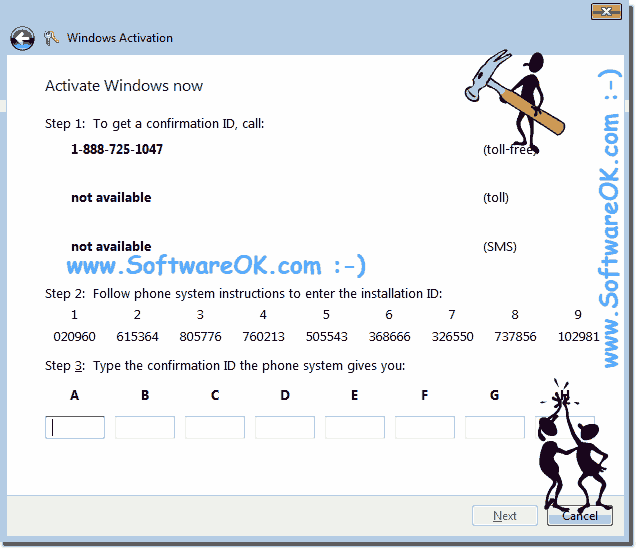 Activate windows 7 by phone option missing and Windows 7 confirmation id phone? Activate by phone doesnt show up int he options to activate? Use the automated phone system to activate? Use automated phone system to activate not available? Is Windows activation by telephone line possible from Myanmar? What is the confirmation ID the phone system gives me windows 7? Activate window7 ultimate by automated phone system? Windows 7 ultimate 64 bit automated phone system to activate? What is the confirmation ID of the phone that's given for Windows 7 ultimate? How to start the activation wizard again for window 7? What to enter in confirmation id windows 7 ultimate? How can i get windows 7ultimate confirmation id phone system? Widows professional activation key confermation id phone system? Activate windows key and now type the confirmation id the phone system gives you? How to activate windows 7 home basic via phone key? Activate using automated system missing windows 7? How to call Activation Windows 7 Professional? How to activate window7 with phone? Windows 2008 r2 command to activate over the phone? Windows 7 phone activation, but where do I find it? I would like to enable call Win7! Windows 7 to activate over the phone? What is the command for Windows 7 phone activation? Phone Number automated phone system from Microsoft? Windows 7 telephone activation is not offered? The option is not displayed to activate by phone? How to start phone activation again? Windows 7 product activation phone number. I can not find, how does Windows 7 activate by telephone? I want to activate Windows 7 over the phone! Is it somehow? Where is the phone number for the activation of Windows 7? Windows Activation in Windows 7 Starter use automated phone sysytem to activate? Windows 7 can't get option to activate by phone? I can't start the windows 7 activation wizard? Us windows 7 product activation telephone number? Use the automated phone system to activate is missing? How i active windows 7 by using the automated phone system? How to activate W7 via phone? Activate via phone win 7? How to active Windows 7 over telephone command? Confirmation id win 7 ultimate 32 bit? Windows activation key for computer ,the cofirmation ID thr phone system given? How to ac, automate phone system to activate? Windows 7 force automated phone, Phone activation command? Windows 7 phone activation not available, phone system for window 7? Automated phone activation windows run command, ACTIVATE WINDOWS via phone? Cara mengisi confirmation id phone system gives you? Windows 7 product key typevthe confirm id the phone system? Activate windows 7 by phone cmd? Windows activation via activatio n phone number? Windows 7 phone activation missing? Step 1: to get a confirmation id,call? Command to phone activation invoke? Activate thru phone win 7? Display windows activation phone number cmd windows 7? Activate windows 7 over phone uk? How to confirm id the phone system windows 7? Confirmation id the phone system? Type k9nfirmasi id phone system windows 7? Show windows activation by run? Type the confirmation id the phone system give you?